"Sampath Speaking" - the thoughts of an Insurer from Thiruvallikkeni: Shubhman Gill debuts ! ~ stunner of Hardik Pandya was blindfold technique !! Shubhman Gill debuts ! ~ stunner of Hardik Pandya was blindfold technique !! 1983 India’s tour to WI there were surprises – Kapil Dev was the Captain, Anshuman Gaekwad and Srinivasan Venkatraghavan recalled for their experiences for the toughest tour and .. .. there was an young wicket-keeper, Kiran More, a leading Tamil daily put his name wrongly, as those days, many prospects were literally unknown beyond their territory. .. not any longer – people follow and some make impact at young age .. Shubman Gill is a prodigy – Kohli praised him of possessing so much talent that he himself had only 10% at his age !! Shubhman Gill’s rise has been meteoric .. .. his first call-up to the national squad may have come in unexpected circumstances - with India forced to replace Hardik Pandya and KL Rahul - but it's something Indian cricket watchers had expected would happen, sooner rather than later. Yuvraj Singh, his Punjab team-mate, had said "He (Gill) is a special talent. After a long time there is a young guy whose batting I like to watch. He is very exciting. After the 2019 World Cup, he can make it to the (Indian) side." The sudden vacancies in the squad have meant Yuvraj's prediction has come real much sooner. In strange circumstances, he is replacement for Hardik, who has played a match already .. today reportedly MS Dhoni was not yet fit, but he handed over a new cap to an exciting debutant in recent times. Rwanda is a country in Central and East Africa and one of the smallest countries on the African mainland. Located a few degrees south of the Equator, Rwanda is bordered by Uganda, Tanzania, Burundi and the Democratic Republic of the Congo. .. .. Abuja is the capital city of Nigeria located in the centre of the country within the Federal Capital Territory. Abuja is Nigeria's administrative and political centre. It is also a key capital on the African continent due to Nigeria's geo-political influence in regional affairs. We are reading because of some Cricket happening in Abuja – yes, Rwanda womens team is playing a ODI series with Nigerian team. In New Zealand, Smriti Mandhana continues to be a smashing hit – this time with Mithali Raj for company, she scored big for a second game in a row - she has passed 50 eight times in her last ten ODIs - to lead India to an eight-wicket winin the second Women's Championship game in Mount Maunganui on Tuesday. The win, though, was set up by India's bowlers, who, after Raj opted to field first, shot the home side out for 161 in 44.2 overs. Amy Satterthwaite, the New Zealand captain, did her bit by scoring 71, but there was little of note apart from her innings as India dominated proceedings. Jhulan Goswami had the best returns among the Indian bowlers, but it was a combined effort, with all the frontline bowlers getting among the wickets. With a small target in front of them, India started poorly, losing Jemimah Rodrigues for a duck in the second over and Deepti Sharma for eight not much later. But that's where it ended for New Zealand, as Mandhana and Raj put together an unbroken stand of 151 runs to take India to the target in just 35.2 overs. In the 3rd ODI, everyone was talking about that absolute stunner that Hardik Pandya brought out to dismiss Kane Williamson .. .. .. and media is putting technology behind that stunning effort. A 'blindfold technique' to increase reaction time, leather balls of various weights to gauge trajectory in breezy conditions and a simulation machine for slip-catching have made the Indian team a remarkably improved catching unit, fielding coach R Sridhar said on Wednesday. While the 'blindfold technique' was specifically used in England for red-ball cricket, a simulation machine called 'Teammate' was used in Australia for slip-catching. When asked about the 'blindfold technique' specifically, Sridhar explained: "We have a feeder behind a curtain and the catcher doesn't know from where the ball is coming from. "We would slide it from under the curtain...It did improve their reaction time (reflex), we did that extensively in England throughout the Test series. It was specifically for red-ball cricket." Now, balls of varying weights are being used during the ODIs against New Zealand in order to help the players prepare for skiers with steady breeze threatening to change the trajectory. "We brought a different type of machine called 'Teammate' for slip-catching simulations. We did a lot of blindfold work or reaction work. By the time, we reached Australia, it was a well-oiled machine and if you see, Virat took some brilliant catches," the fielding coach gave a peek into his trade secret. 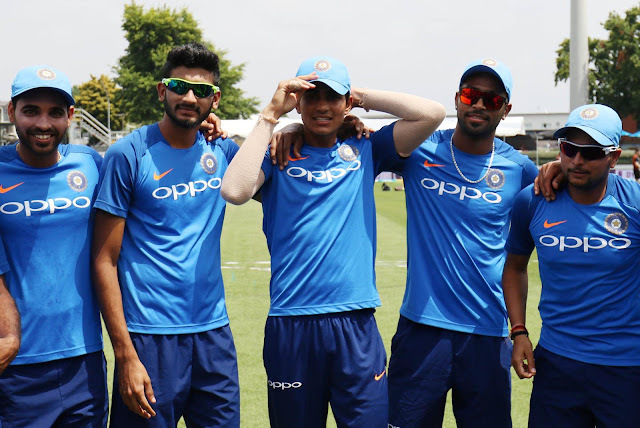 Asked about how the team is countering the breeze while handling skiers, Sridhar said: "The biggest challenge you face in New Zealand as a fielder is the breeze. Most of the batting and bowling plans are based around that breeze. "If we see the ball wobble a lot in air, we try and simulate that in practice, use balls of different weights, so that the ball swerves and swings more in the air." Sridhar also informed that the Indian team's support staff is in touch with various IPL teams to ensure that players adhere to the "follow-up programme". Sridhar also praised comeback-man Hardik Pandya's stunning catch off Yuzvendra Chahal's bowling to dismiss rival captain Kane Williamson. "The desperation he brought was magnificent to see. He is always a good fielder and dying to get into the thick of things and be a part of this and get back to what he loves doing, that is to play cricket and as best as he can." "He (Pandya) made a very difficult catch look easy. It was a piece of magic and he is known for that and he is one of our best fielders. Hardik brings a lot to the team. Not only the balance but other factors as well," he concluded.